New Audi A3 vs used Audi A4: which is best? | What Car? New Audi A3 vs used Audi A4: which is best? 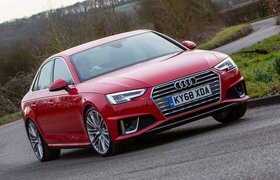 In many ways, the A3 saloon is in a class of its own, since it is derived from a relatively compact five-door family hatchback, the A3 Sportback. The Mercedes-Benz CLA is an individual-looking low-slung four-door car based on the underpinnings of the A-Class. It’s not nearly as nice to drive as the A3, however, nor is it as classy inside. The main rival to the A4 has always been the BMW 3 Series. This is still a great car, being fun to drive with strong performance and spirited handling. Inside, the 3 Series has a classy interior featuring BMW's excellent iDrive infotainment system. Used prices are strong and there are plenty to choose from. New Audi A3 vs used Audi A4 – which is best? The A3 is a smart and agile car that would please any owner. However, against the larger A4, it is inevitably a little short on space, especially in the rear. And if you’re buying your car for family use, this might sway you in one direction. Added to that, the A4 feels the quicker, more refined car, and it’s more economical on paper. You’ll also be buying a car that’s already had the sting of the first year’s value drop, whereas the A3 would have that all to come.